If you’re in need of crossover platforms to provide safe, convenient work conditions in your facility, Marco Specialty Steel is your partner. We supply custom crossover platform systems according to your specifications and drawings, so you don’t have to settle for catalog platforms that don’t suit your needs. We can fabricate your crossover stairs, crossover ramps, crossover ladders or rooftop walkway systems. A well-placed crossover platform allows a safe walkway over busy work areas, heavy traffic, obstacles or hazardous environments instead of having to go around or through them. Crossover walkways shield expansive equipment, pipes, conveyors, air ducts, skylights and cables from foot traffic damage, reducing maintenance costs and production downtime. Crossover Platform Systems can be made of a variety of materials which makes them super handy for our clients individual needs. Each crossover system type has individual benefits. Fiberglass grating, or FRP crossover platforms are slip resistant, non-conductive, corrosion-resistant, chemical resistant and virtually maintenance free. They are a good solution for many industries including oil and gas, where platforms and walkways stay wet or in contact with harsh environments. FRP crossovers are available in molded grating and pultruded which can be produced with heat resistant phenolic material. Bar grating crossover platform systems are good sturdy safe walking surfaces that can be fabricated to your specifications. 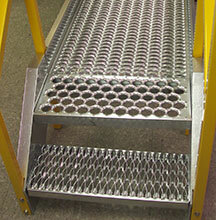 Bar grating crossovers are slip resistant and can be made from almost all our bar grating options. Expanded metal grating is a heavy-duty material that is used for platforms due to its grip type surface, durability and strength. 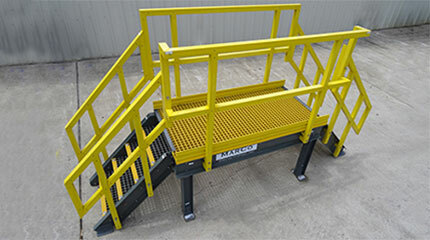 Diamond safety grating, Perf safety grating, and Tread Grip safety gratings are all good safe surfaces that make outstanding crossover platforms. In some cases different materials are used for the stairs and the platform itself. The platform is created from grating panels and the stairs are made with stair treads. Our steel walkway planking comes in 12” wide sections. We can add multiple planks to create widths of 24”, 36” or greater. We can also accommodate any length you need thanks to our ability to custom build our steel frames to your specifications. With multiple base dimensions available (including common 12” x 12” and 10” x 8” sizes), it is possible to adapt to any load and flooring type. Frame: The frames of our crossovers are made from rugged roll-formed tubular carbon steel and 304 stainless steel in a 12-gauge thickness. Walking planking: The walking surfaces of our crossovers are made from thick 18 gauge steel that has been serrated for added traction. Base material: The base material supporting our crossover platforms are made from durable and impact resistant injection molded polypropylene. The choice of these materials is to provide the best combination of strength and durability to give you years of service out of your crossover work platform. Custom-adapted solutions: Your facility is unique and requires unique crossover installations. Trying to fit in “standard” platforms often means sacrificing convenience and safety and forces you to adapt your existing installations. This is why we offer custom-fit solutions that take into account the layout of your building and any pipes, trenches or other obstacles. Speed: When you decide you need a crossover work platform, you want it right away. Instead of waiting for a custom construction built from scratch, we start with our existing products and platform models and adapt them according to your needs. This saves time and allows us to fabricate your custom crossover platform system quickly and allows you to reap the benefits. Quality: As fabricators of all of our platform products (frames, grilles, railings, etc.) 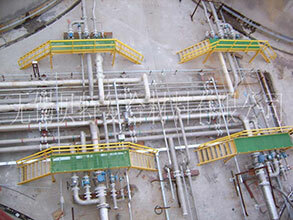 we can assure the total quality of the platforms we fabricate for you. We assure the quality of our raw material, dimensions and joining — be it welding, bolting or other types of attachment. The result is a top-quality crossover work platform that’s ready to be put to work. Having an in-house fabrication shop allows us to take your drawings and blueprints and turn them into reality. We have the advantage of manufacturing all of our own materials, meaning we’re your one-stop shop for all of your facility platform projects and installations. Don’t settle for a work platform supplier that expects you to adapt your installation to their platforms. 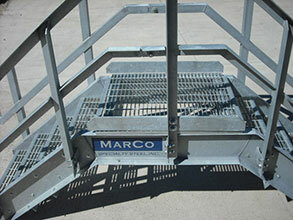 Choose Marco Specialty Steel for a quality, custom-fabricated crossover platform that includes the features you need. We have years of experience fabricating work platforms using our own custom components and materials for all types of industrial applications. Next time your plant or rig needs a custom crossover, call Marco. We invite you to send us your specs and blueprints for a consultation. You can upload them right here on our site or send them by email, fax or overnight mail. One of our team members will consult your drawings and get in touch with you to discuss your project in detail. We can even create custom print takeoffs to help your project stay on track. Choosing Marco Specialty Steel for your custom crossover platform configuration allows you to make the most of your space and give your employees the safest and most efficient work area.